Malaysians are known to be a friendly lot who are warm and welcoming of visitors. If you are curious and would like to know more about this legendary Malaysian hospitality, you may want to consider participating in the popular homestay program offered in various regions around Malaysia. A homestay program enables a visitor spend a few days interacting closely with a Malaysian family by living with them in their home. During a homestay, a visitor is encouraged to participate in the host family’s various economic and social activities. This Malaysian homestay program was conceptualized and launched by inventive tour operators in 1995, in an effort to boost tourism arrivals to the country. The program aimed to offer visitors the chance to experience first-hand the authentic Malaysian way of life, by living among Malaysian people. The Malaysian homestay program in its present form offers diverse homestays at carefully selected, inspected and licensed dwellings in approximately 150 kampongs (villages) situated all over the country. The highest concentration of homestays however, is known to exist in states like Sarawak and Sabah on Borneo and Johor, Pahang and Selangor on Peninsular Malaysia. A homestay further gives visitors the chance to have an authentic Malaysian life experience as they proceed to learn about Malaysia and its people. For instance, during a homestay, visitors are likely to be introduced to various native Malaysian crops and fruits, like paddy, palm oil, cocoa, mangosteen, soursop, pandanaus, longan, durian and many more. Moreover, visitors are also be expected to consume much local fare like Nasi Lemak, Rojak, Curry Ayam, Ikan Bakar and Asam Pedas for they generally feature as items on an everyday Malaysian diet, for the price of homestay in Malaysia, usually includes full board and lodging. Guests are also invited to accompany the family’s bread winners as they go about their daily tasks to earn their livelihood. Visitors then have the opportunity to participate in various village-based economic activities like breeding fish, tapping rubber, planting (or even husking) paddy, economic pursuits typical of the Malaysian countryside. Homestay participants are also introduced to various native Malaysian arts and crafts as they are given the opportunity to try their hand at various native, artistic endeavors like batik-painting, woodcarving, pandanaus-leaf mat-weaving, ceramic making amongst various others. Homestay visitors are usually feted by their hosts and they often invited to take part in traditional village past-times and activities like attending marriages and various other social gatherings (kenduris). They are also invited to take part in traditional games and past times like congkak(a popular Malaysian indoor game), Sepak Raja(a fun traditional ball game),gasing (top spinning), kite flying and more. If you would like to know more about Malaysia and its people, then why don’t you try and book an authentic Malaysian homestay for your next trip to the country? 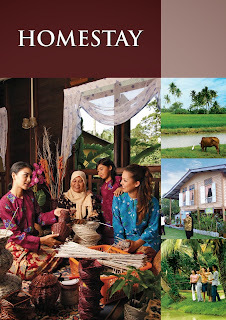 You are bound to be enchanted and delighted by this one of a kind, unique experience which offers you an up close and personal view of life in a traditional Malaysian kampong.